Entries tagged with “Luther Burbank Park”. I include the aerial photo from Hoge’s portfolio here (on the left) because it demonstrates once again an aspect of land art that I find so fascinating: the effect of time on these pieces. 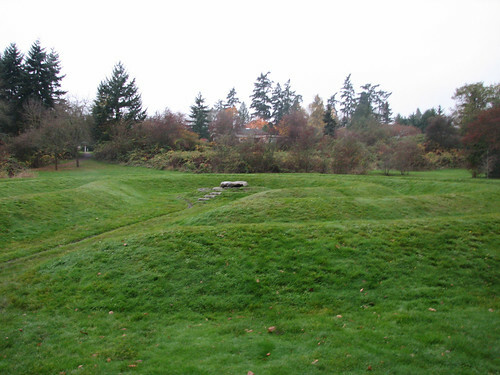 The three encircling grass embankments have such definition in this photo, sharply defined and clearly outlining and demarcating the piece. 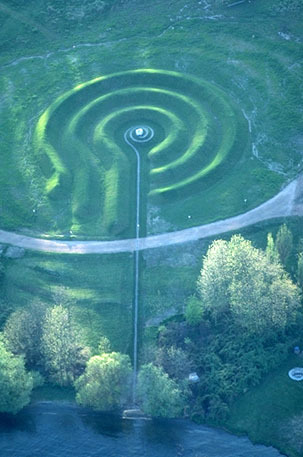 While an aerial view is always going to be different than the the view from the ground you can see in this linked photo from Hoge’s entry on the City of Kent’s Earthworks page, that it was just as clear in outline from that perspective as well. “In my own work, my preferred choice of materials are the natural ones: stone and other earth products. I am particularly interested in stones’ naturally occurring characteristics, formations and textures. Much of my work strives to retain, enhance and abstract naturally-occurring shapes and lines through direct carving techniques. I then use textural gradations and stone polishes to create transitions between natural surfaces and worked surfaces.” – John Hoge from the City of Kent’s earthworks essays. Of all of the earthworks I’ve looked at The Source has the least information online and the material linked in this post are about all I can find. 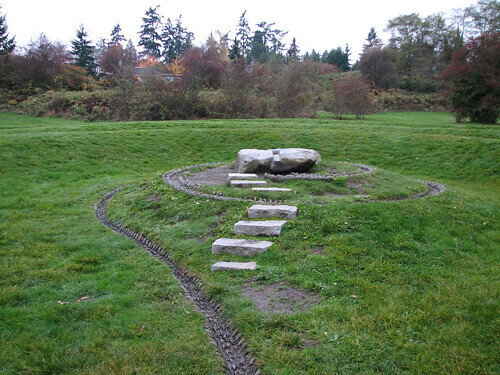 This piece was built during that the era that the King County Arts Commission (now 4Culture) was heavily promoting and investing in radical public art projects. Hoge was hired to document and liaise with Herbert Bayer during the construction of the Mill Creek Canyon earthwork and while he is perhaps not as well known (and certainly not the degree as Robert Morris) this is I think as great a piece as the others. It is perhaps its more sculpturally nature and does not that combination of public works with works of art that is a major component of many of the well known pieces, this but I think in many ways that adds to it. 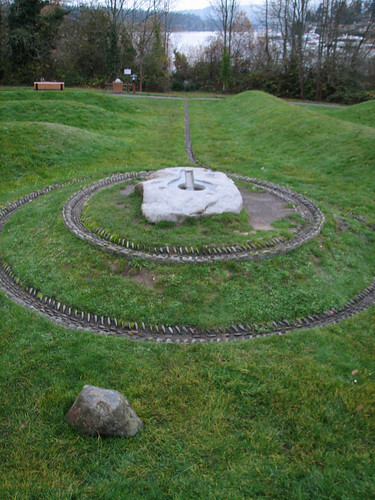 Perhaps its form invokes Spiral Jetty a bit too closely, which is another piece that I think is more art for arts sake but also like Spiral Jetty, I think The Source fits perfectly into its environment and was clearly constructed for it. 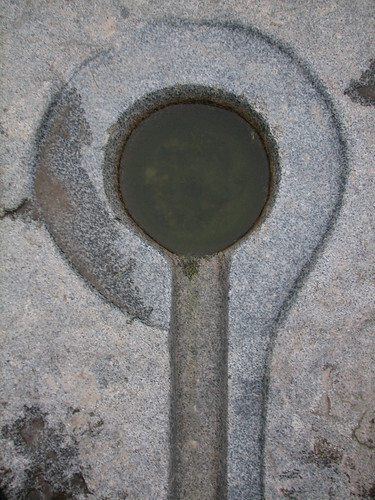 I think its form is fantastic – the whorls that end in a little basin in the central stone that like an alter has steps leading up to it; the stone lined channel that runs down to Lake Washington; the embankments that surround the stones and evoke those same whorls but also prehistoric structures like BrÃº na Bóinne who over time become little more than grass covered mounds. And most charmingly the little stone offset from the central structure that evokes nothing more than the heelstone at that greatest and most well known of all earthworks, Stonehenge. Check out all of my photos of The Source at Flickr. A Spiral Cage is powered by	WordPress 4.6.14 and delivered to you in 0.285 seconds using 22 queries.